Click on picture to see the album. I was talking to God and he told me I would find the sunrise at Ft. Lauderdale to be spectacular just for me. So on the way to my 8 a.m. fishing trip I drove along the beach and he being a man of his word presented me with a magical moment. The sun rose behind dark sculptured clouds over a calm sea. The beach had been racked with curving wave patterns on the sand and I was one of the few enjoying the view. A perfect start to what I felt was going to be a perfectly extraordinary day. Elizabeth was going to accompany me as a bystander on the fishing trip since she has a boating past and loves the sea. However the temperature had drop 10 degrees to the 70's but in the evening it dropped even further to the 60's. With the morning chill in the air Elizabeth opted to stay in bed and off I went on my own. There were 5 other fisherman on the boat and a young lad of one of the men. The day was glorious and so we set sail. Alas there was a fly in the ointment. The trip cost $145 a piece but they needed to get some bait so it was a $20 further charge. This was times four, $80 in total . As you will see we got 8 bait fish meaning that each one of the little buggers cost $10 apiece. To further add insult to injury that wasn't enough so we fished for a half an hour for more bait fish and caught another two for nothing. They are called Bointas. Interesting how they rip you off little by little. We finally got out a mile or so and began fishing. By that I mean that the crew set up the reels for you and you wait your turn to grab a reel when it starts singing with a fish on the end of the line. They ran two kites with two hooks on each of them to the right and left. They were at the end of what looked like a TV tower to each side of the boat. Over the back was another 6 rods all primed and ready. We received a little lecture on what we were fishing for. 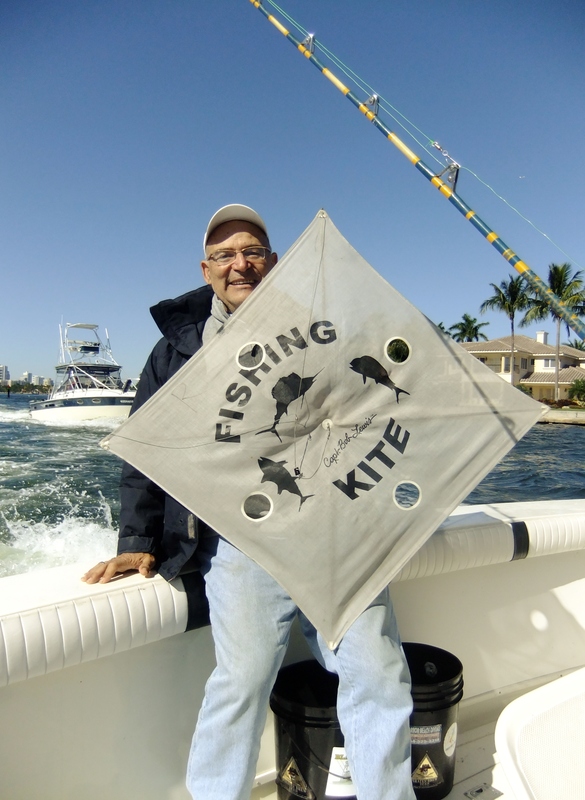 If we caught a sailfish, shark, dolphin or other trophy fish they would haul it in let you take a picture, measure it and then release it back into the sea. To me it made sense rather than killing off the very reason people go fishing to the point where they were none left. The other fish, the edible fish which include, bluefish, bonefish, flounders, groupers, sea bass, mullets, pampanos, porgies, snappers, tarpons to name but a few we could keep and they would filet it for us and if we were lazy they recommended a restaurant on the pier that would cook it for you. We didn't catch anything for about a half hour and decided to move our boat out further. The seas were rougher there. It was at this point I realized I had left my Gravol on the table at home. It was looking like I might be needing it. Sure enough at one point I began painting the side of the boat as I brought up. I was sea sick. Uncomfortable as hell and weak in the knees. I sat down but that didn't help. I stood up but that didn't help. I finally ended up lying down inside and fell asleep. I awoke and hour later disappointed I had probably missed all the fishing. I had, but no one had caught anything and we were moving to another position were the waves were a little less undulating. The swells here were 4 to 6 feet whereas we had been experiencing 8 to 10 feet. I was getting my sea legs by this point. We fished for another hour trying every tactic that the Captain and First mate could think of to land a fish but to no avail. The greatest disappointment was for the young boy who had been given this trip as a Christmas present. We lingered off the entrance to Port Everglade overtime to see if we could catch something for the young lad but to no avail. The entire fishing trip had only yielded two bait fish caught by the crew. We headed back to the dock with saddened faces. We past another larger fishing boat with 40 fisherman aboard. Their entire group had caught only two fish. It wasn't us it was just the luck of the draw. I came home and picked up Elizabeth and told her she hadn't missed anything. We went two blocks over to Lauderdale-by-the-sea and had lunch at the Aruba restaurant which in my memory had been in the same place by the sea since I visited this area in the 60's. It is a classic American Bar with a Caribbean decor, lots of beer and food, friendly wait staff, a live steel drum player and friendly people. They had a unique system of notifying people when their table was ready. Instead of an electronic pad that flashes telling you your table was ready they gave you a balloon on which they had written a name in felt pen. So one balloon would have Santa, another Happy and so on. I thought this was inexpensive fun way of getting the job done. We sat at the bar which is our preference in these types of places. Next to us sat Dennis and Chris with their adult son. They were from Mrytle Beach and had come down for three days. As it turn out they were staying at the same motel as we were. They were friendly and told us that evening there was a great place up the beach called Stingers and it was Customer Appreciation Night. We told them we would join them that evening. As we left the Aruba I finally caught the fish I had hoped I would catch at sea. When you look at the pictures you will understand the humour of what I caught. That evening we arrived at Stingers. We were introduced to the owner. His name was Dave Bee. Now you understand how the place got its name. True to form everything was on the house. The Booze and food. The entire crowd was our age. In Florida seasoned youth like Elizabeth and I where you could find bars and restaurants filled with people of the same age bracket unlike Toronto where places like this don't exist. Dave and I had our picture taken with his delivery vehicle a golf cart dressed up like a bee. It was all great fun and we spent 3 or 4 hours in an extended happy hour. Elizabeth even got a buzz drinking beer a substance she had never before become elated from before. We finally packed it in and brought Dennis and Chris back with us to the Courtryard Villa and called it a night.